Pizza Pizza- all your pizza favorites, served daily, including the feature of the week. We offer chicken wings and chicken bites, meatballs and meatball sandwiches. Great Deal Daily-The Sheridan Combo, which you can share with your friends. Chef's Corner - Featuring a daily menu of all your favorites from home. Available daily the famous Kal's Rice Bowl with a hint of chipotle. OTG- Offering a variety of packaged fresh salads, unique sandwiches, beverages and snack items perfectly packaged to go. 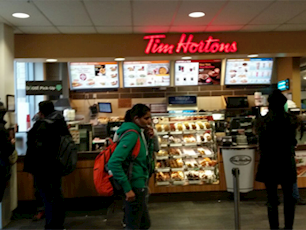 Tim Hortons J Wing - What college campus is complete without a Tim's? This full-service Tim Hortons features all your great Canadian favourites. You can get everything from your coffee and a donut all the way to a classic Tim's sandwich. The true Canadian taste right here at . 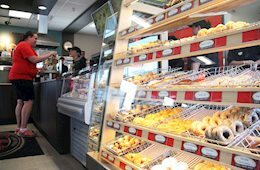 Tim Hortons C Wing - The Real Tim's taste with full service food, meaning you can get everything from a coffee all the way up to a Tim's sandwich. Chef's Corner-features a number of Chartwells proprietary programs including Menutainment. Enjoy the campus favourite rice bowl. Soup Emporium features 3 daily freshly prepared soups and/or chillis. All dietary options available including Gluten, Vegan, Vegetarian, Low Carb, Low Fat and Halal. Whether you are looking for a quick snack between classes or staying for lunch, this is the place to be! PIZZA PIZZA - all your pizza favourites, including the feature of the week, we offer chicken wings and bites, meatballs and the meatball sandwich. Great Deal Daily-The Sheridan Combo to share with your friends. Grill & Co - A limitless interpretation of traditional burgers and hot sandwiches accompanied with a variety of sides, all grilled to order. Proudly serving Starbucks Coffee in the Marketplace! Tim Hortons Express & Full Station - All your favourite beverages now available for your on the go lifestyle. Starbucks® - Starbucks® offers high‐quality whole bean coffees, Italian style espresso beverages, blended beverages, Tazo® teas, and a variety of pastries and confections. SUBWAY® has a wide variety of subs, salads, and sides to choose from. Every one of their subs is made fresh in front of you, exactly the way you want it! Thai Express, a new take on traditional Thai Cuisine, tailored to your taste and prepared fresh when you order. Thai Express believes in providing variety, quality and authenticity. Chef's Corner-features a number of CHARTWELLS proprietary programs including MENUTAINMENT. Enjoy the campus favorite chipotle rice bowl. Soup Emporium features 3 daily freshly prepared soups and/or chilis. 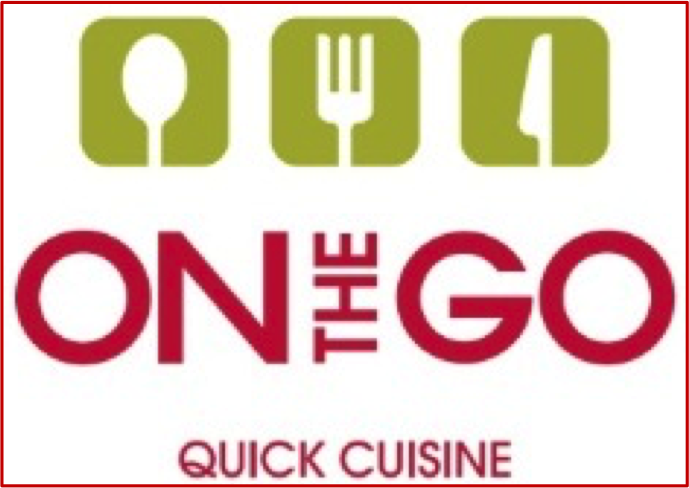 OTG- our signature take away coolers with great salads, sandwiches, Under 3 selections, parfaits, yogurts, fruit etc. HEALTHY EATING has never been so easy! BALANCED CHOICES identifier is added to a variety of healthy food choices that meet the fat and sodium criteria for our company. Harvey's - one of Canada's best loved burgers. Have it your way! 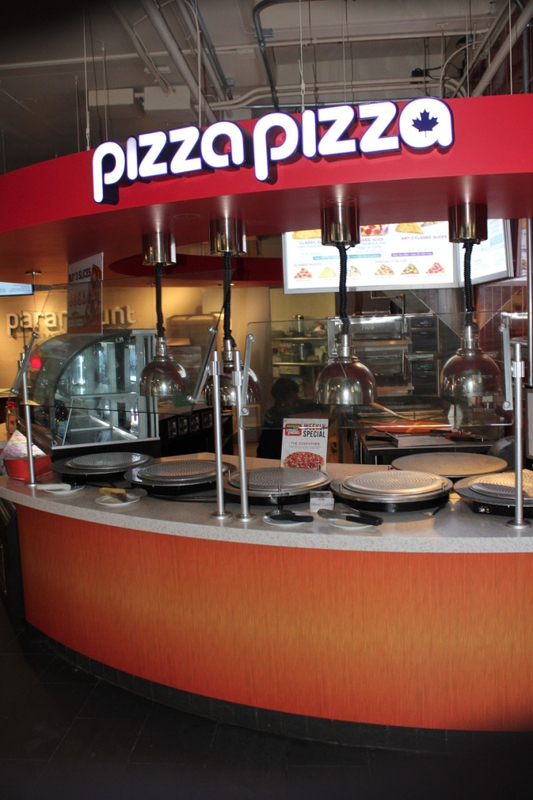 PIZZA PIZZA - All your pizza favourites served daily. Enjoy chicken wings, bites, meatballs and of course the Sheridan Combo Special. Tim's Express- serving that great cup of java with their muffins and pastry selection. 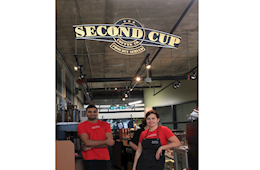 Second Cup - Enjoy great trendy specialty coffees, decadent sweets and sandwiches at this location. 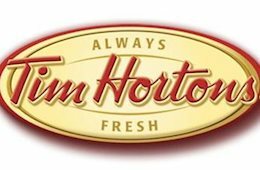 Tim Hortons B Wing - This full-service Tim Horton's features all your favourites! Tim Hortons C Wing -If the B-Wing Tim Horton's is too far, why not enjoy the Canadian Classic from the commons in the C-Wing.